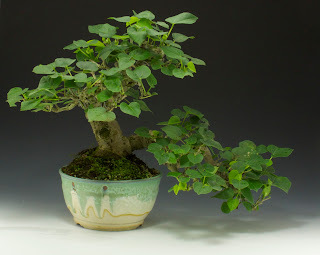 At our monthly bonsai club meeting this past Friday, I had the opportunity to photograph a few of one of my favorite customer's trees. This first pic is a Campeche, also known as logwood or bloodwood; a name referring to its hard dark heartwood. This is a tropical ornamental tree that grows in the Yucatan and northern south america. It was used for centuries by indigenous cultures for many medicinal purposes, as well as for its lumber. 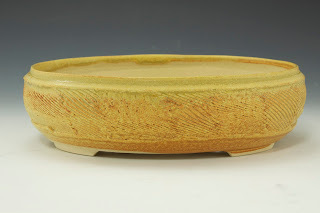 Peggy chose this oval with a pale cream glaze, which I think is great choice. 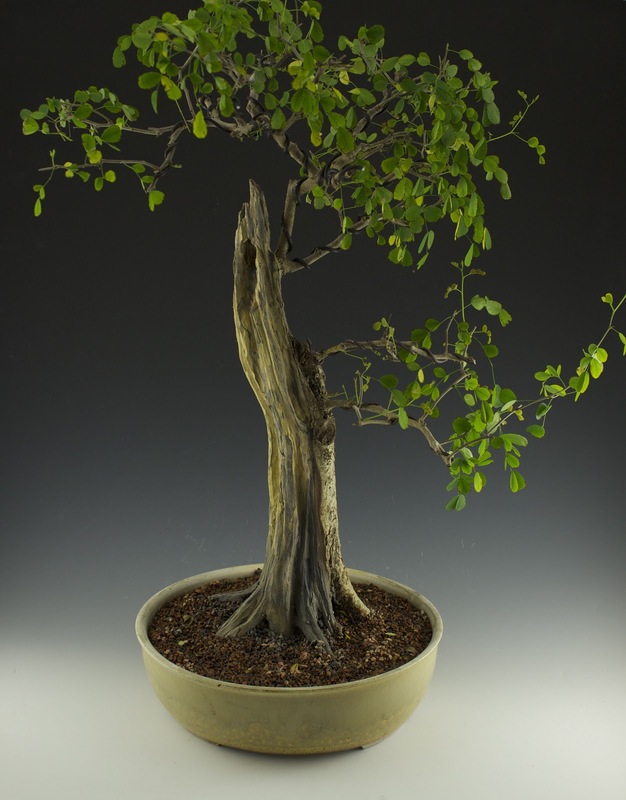 The pot is quite well suited to enhance the color of the trunk and cool grey greens of the foliage. At around 30 inches tall, this guy almost didn't fit in the photo setup! Great tree though! If you prefer cool grey green hues in a bonsai composition then this next tree would be a good fit. This is an Ilex Shillings, or Yaupon, a type of Holly. I had to under expose the composition a full stop just so the colors of the pot came through. 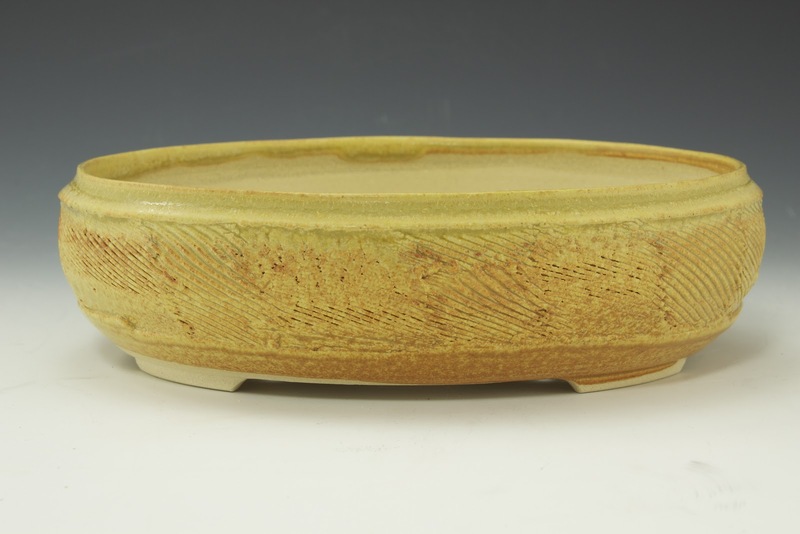 In my opinion, this pot matches the foliage and wood tones just superbly! The Brazilian Raintree is popular tropical specimen for a bonsai. It features bi-pinnately compound leaves and a creamy green wood. An interesting feature of this tree is how the trunk grows. It can bulge and undulate, giving it a character all its own. I want to thank Peggy for all of her support. She is a very active woman in our club and her attention to detail truly inspires me! Thanks again! 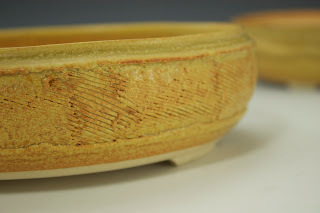 Here is a lovely fake ash glaze that works really nice with texture. It has a lovely orange yellow hue to it, very well suited to many species for bonsai. It works great on masculine and feminine compositions, and it can be used to highlight form quite effectively. Here you can see how the breaking of color from the texture enhances its form. Here is a new technique I have been playing around with. I love the folds!! Here is one of my pots outfitted just perfectly for a customer's Hibiscus. It sports yellow flowers when in bloom which will really add a nice balance to the composition. Its just kinda funny when things just work out, eh? No, I didn't expect this pot to turn out the way it did, but I am happy with the accident! 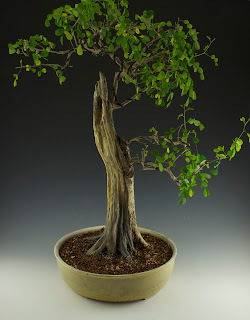 I would like to take time to thank Owen Reich, Kusamono and Bonsai artist for this lovely photograph. 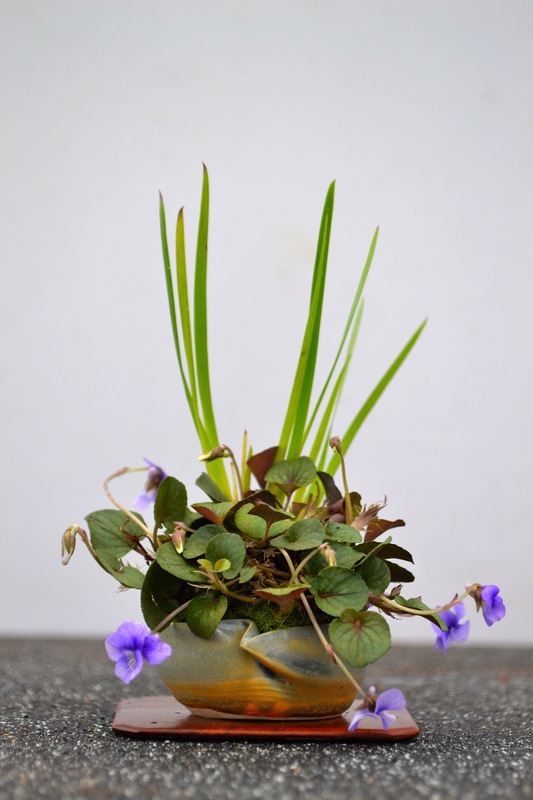 He chose this particular pot of mine for his planting of Viola and Acorus. 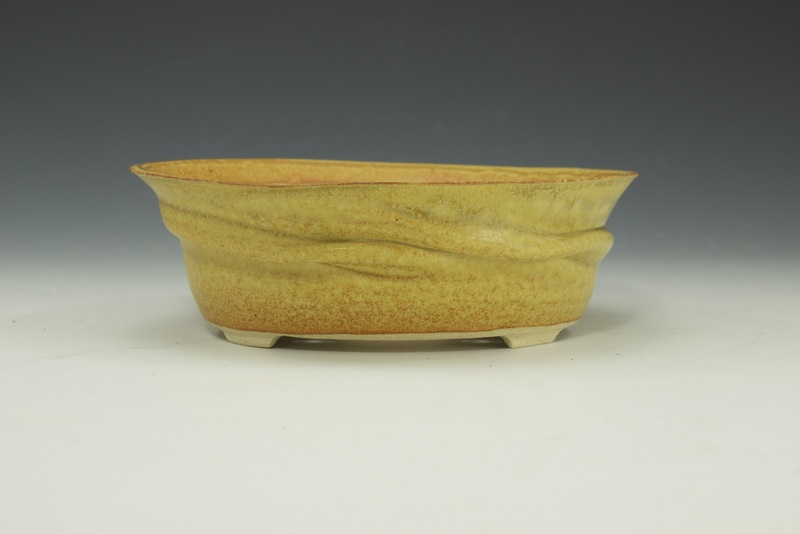 The color of the pot has nice oranges and greys giving warmth and unity to the composition. Symbiosis is defined as the intertwining relationship of two different species. 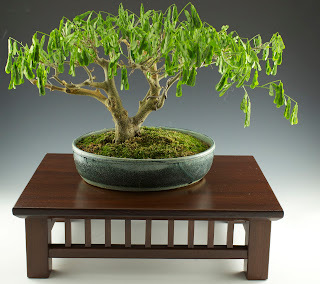 I admit to using this term metaphorically but I think it fits the bill in this bonsai. No doubt it is a rather untraditional combination, one that invites several second glances. Like a pair of faded blue jeans or an old rusty ford pickup, this guy has quite a bit of visual appeal. A few things I like about this composition are the interplay of form with the lower trunk. Lots of movement. 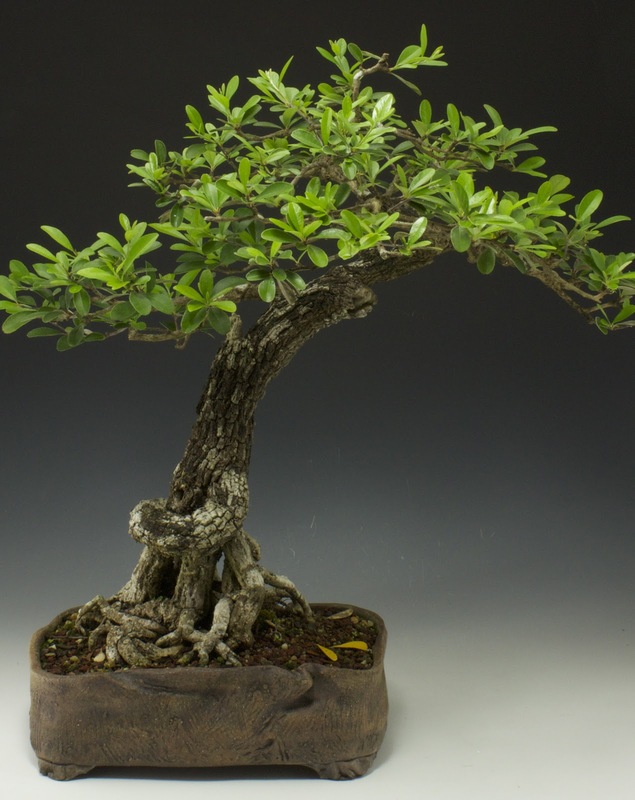 This helps to bring out the character of the tree and give it personality. The color works well too. When this photo was taken I had the luck of having new spring foliage. The chartreuse hue of the leaves balances nicely with the pot color. 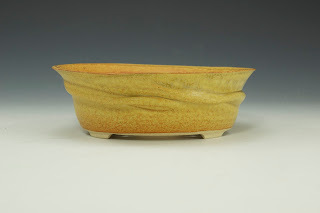 Even in the shadows of the folds of the pot, the color relationship is very harmonious. I know that there will be critics who see this tree as too different, but I beg to differ. 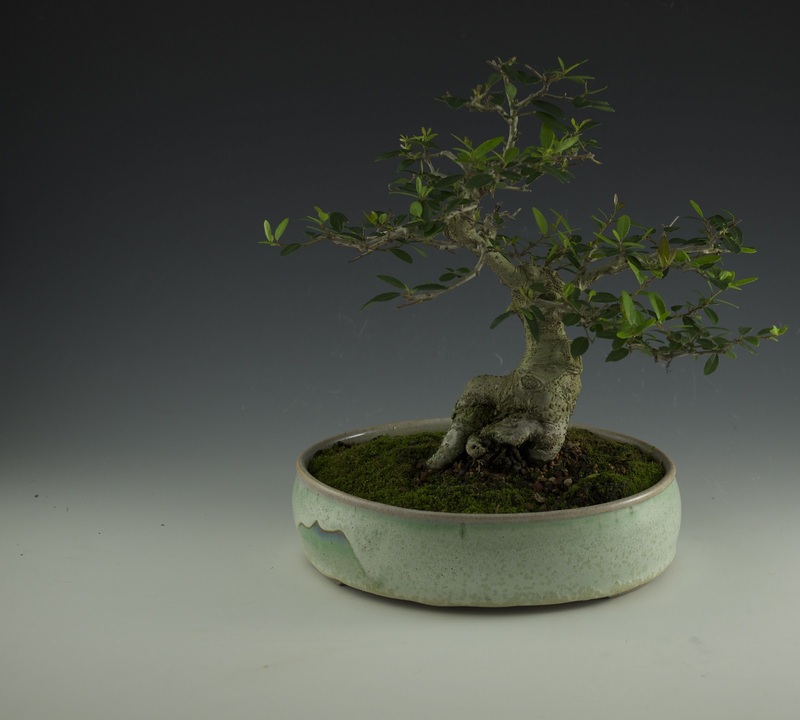 A close look at the artistic elements in the tree, trunk and container will reveal the caliber of bonsai artist Mike Rogers. Traditionally tempered, yet artistically assertive. opportunity, being able to see my work used in the most effective and artistic ways.